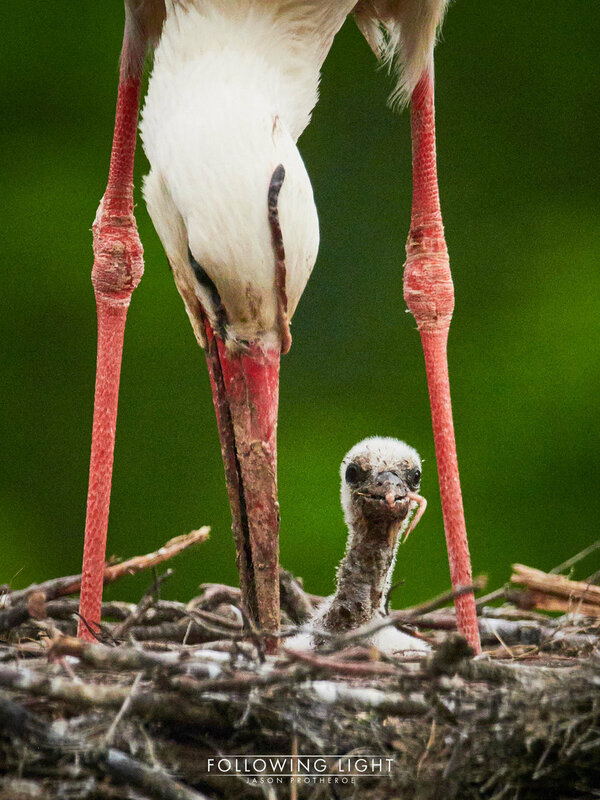 Storks, storks, more storks and just storks. There is no story, there is no journey, the location is in the middle of the city. So this time there isn't much more than the pictures. The storks are making an appearance for a few reasons. I came across a place with a great view of several nests, which gives an opportunity to view the young. Basel and the surrounding area are known for the migratory storks, they're also the symbol of the nearby area of Alsace in France. And the Owls appear not to have been productive this year, they are, or were around but there is no sign of any chicks. The images so far were taken a few days before the chicks hatched, the rest a few days later. These show one of the chicks being fed. I've left out the regurgitation shots. The final image is my favourite, although I would have preferred it without the worm stuck to the head of the adult. and the light was fading so there is a touch too much noise.